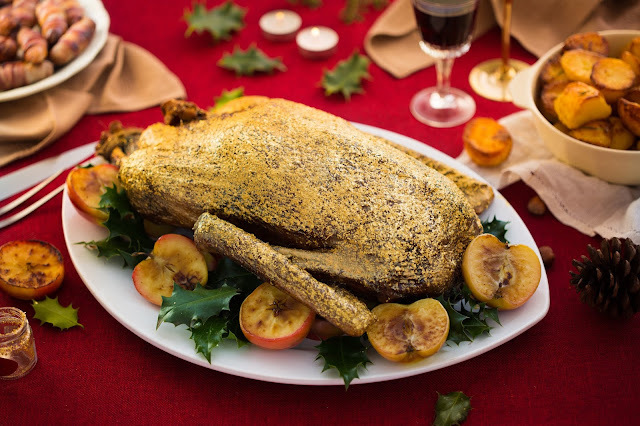 Go for gold this Christmas with Donald Russell's 23 carrat golden goose. Priced at £89 this is the ultimate in luxury for a truly showstopping Christmas Day centerpiece which is topped with edible gold leaf. Hand reared in spacious free-­range conditions for the highest quality as you would expect from Royal-warrant holding Aberdeenshire butcher Donald Russell. The 3kg goose has a wonderfully rustic texture, unforgettable taste and a hint of gaminess reminiscent of good old-fashioned poultry. Topped with crispy skin and edible 23 carat gold leaf for ultimate indulgence. Putting an innovative twist on a much-loved classic, Donald Russell has created the perfect show-piece to sit proudly at the heart of your table. Feeding 4-6 people and taking just three hours to cook, the goose is best basted with a honey glaze to retain its shine. Dedicated to always delivering on excellence, Donald Russell’s exclusive and dedicated flocks of traditional White Feather Geese are hand reared in spacious free-range conditions by the exceptional farmers of Loué, France. I'm delighted to have teamed up with Donald Russell to make your Christmas sparkle with a Golden Goose. Entry is via the Rafflecopter widget below. The Goose will be delivered on 21st December 2017. Good Luck! There is ONE prize of the item listed above. This giveaway is open to UK entrants only and runs until midnight on 03 December 2017. Foodie Quine, as the promoter, reserves the right to cancel or amend the prize, giveaway and these terms and conditions without notice. Disclosure: Donald Russell have compensated me with product in return for running this giveaway and are supplying the prize.